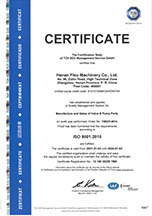 FLEU's quality assurance system is acc. to ISO 9001 and POKA YOKE system. All our factories have been audited by TUEV. The main control include documents, procurement of materials, production processes, tests and inspections, calibration of tools and equipments, non-conforming products and corrective actions for non-conformance. Different materials and casting performance tests can be done by FLEU, such as X-Ray, impact test +20 Grade to –196 Grade, mechanical property – 45 Grade to +400 Grade, torsion test and so on. Through the most stringent test and inspection procedures, FLEU can ensure that products' materials and performance can meet all the applicable test standards. FLEU always do all the effects to make Environmental Friendliness Production and products. For every shipment, FLEU can provide the 3.1 report or 3.2 report by TUEV.